Agent James Bond (George Lazenby, What Have You Done to Solange?) falls in love with a troubled Italian aristocrat, Countessa Tracy Di Vicenzo (Diana Rigg, The Hospital), and they team up to fight evil mastermind Ernst Stavro Blofeld (Telly Savalas, Cape Fear), who is developing biological weapons from his lair in the Swiss Alps. Richard Maibaum adapts, faithfully, Ian Fleming’s 6th novel, and newcomer Peter H. Hunt, who had edited the first three Bond movies (interestingly, the film’s editor, John Glen, will also be given the chance to direct), was hired to bring the script to life. 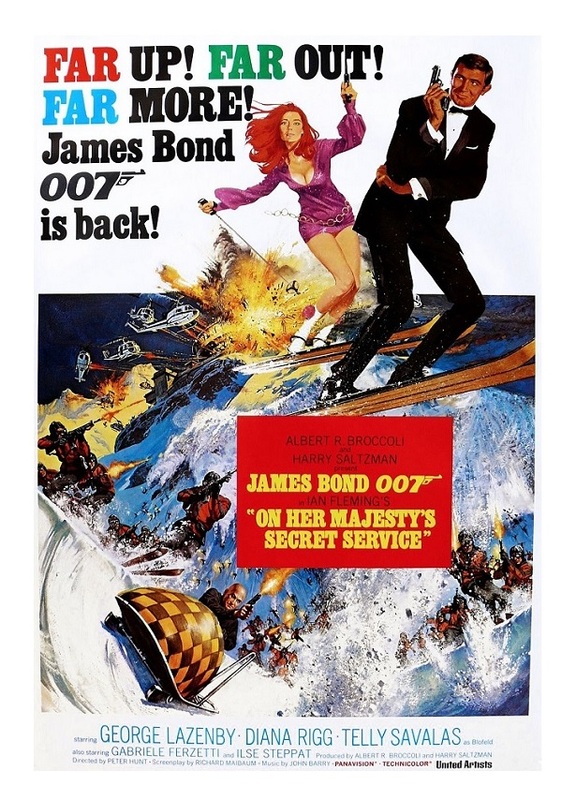 There is a small, but vociferous minority that has always insisted that On Her Majesty’s Secret Service is the best movie in the franchise. I think these fans are reacting to the fact that this is the most ambitious and unusual of all Bond movies. It definitely introduces a host of new ideas — no other Bond movie takes as many chances as this one and that’s refreshing, exciting to see. This is the first Bond movie without Sean Connery — the actor got sick of the whole thing and no amount of money persuaded him to reprise the role for the 6th time. After an extensive search, the producers chose Australian-model George Lazenby — he got the role mostly because he looked a bit like Connery. The inexperienced Lazenby is often cited as the film’s biggest flaw, but I thought he was quite good as 007. He’s not my favorite Bond, but I liked him a lot. Lazenby was careful not to imitate Connery and he is able to make the character his own. Ironically, non-actor Lazenby stars in the only Bond movie where Bond is properly fleshed out. There were a few things that bothered me about the movie, though. I hated its lack of continuity. Bond and super-villain Blofeld had a face-to-face confrontation in the previous movie yet they don’t seem to recognize each other. The producers toyed with the idea of having Bond go through plastic surgery in order to explain a new actor in the role, but the idea was dropped. Too bad because that would have fixed a major plot hole. On Her Majesty’s Secret Service is a little too long. The very first action sequence occurs 90 minutes into the film — that’s pretty strange for a movie of this type. But once the action (finally) kicks in, there is no reason to complain; there are some truly exciting sequences, among the best-staged in the franchise. Although I did enjoy Telly Savalas’s Blofeld, I still prefer Donald Pleasence’s (You Only Live Twice) interpretation. Best of all is Diana Rigg as the ultimate “Bond girl.” Part Elizabeth Bennet, part Lara Croft, Rigg’s Countessa Tracy is quite possible the franchise’s best leading lady. There has been numerous “Bond girls” — some actresses were very talented, while others were super-beautiful — but none of those ladies come close to Rigg; she’s a class act through and through! On Her Majesty’s Secret Service is a solid, almost great action movie — I really appreciated the innovations — but it’s something that I admire more than I love. I do see why so many are drawn to it. I do agree that this is one of the franchise’s most interesting, strongest movies. Color, 142 minutes, Rated PG.